Coffee is the only known host of the fungus Hemileia vastatrix, which causes coffee rust also known as “roya”. 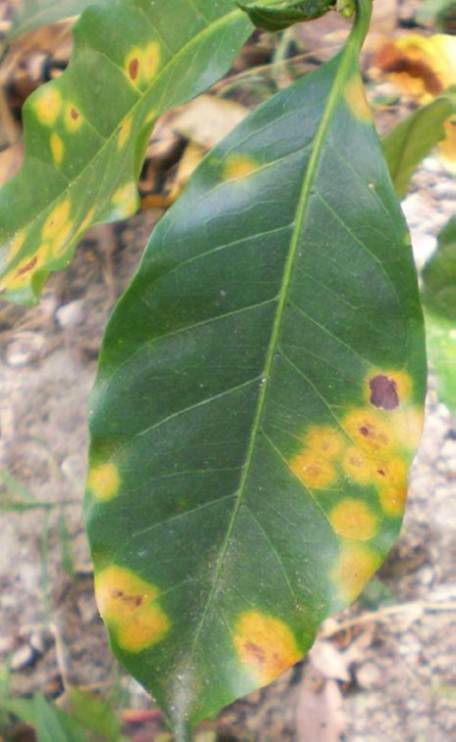 The disease damages coffee leaves by causing the premature drop of infected leaves, which can lower yields by 50%.Coffee rust has become a greater problem for coffee growers because of climate change. Higher temperatures and increased rainfall favors rapid development of the disease. “Costa Rica on Tuesday declared an emergency to tackle the spread of a coffee fungus that has already devastated Central American producers and looks set to destroy about 12 percent of Costa Rica’s planted coffee in the upcoming 2013/14 harvest. A two-year emergency bill, signed jointly by Costa Rica’s Vice President Luis Liberman and the national coffee institute ICAFE, provisions about $4 million to pay for fungicides to tackle the roya, or leaf rust, outbreak. Title: Costa Rica declares national emergency to tackle coffee fungus. Source: Reuters. January 22, 2013. This entry was posted in Fungicides and tagged coffee, coffee rust, Costa Rica, fungicide, fungus by pesticide guy. Bookmark the permalink.